Enjoy an active holiday in the charming mountain village of Rauland by the foot of the Hardangervidda mountain plateau. In the winter season the area offers a wide assortment of skiing opportunities with alpine skiing slopes, a large snowboard park, miles of groomed cross-country tracks, and Norway’s largest toboggan centre at Vierli. Choose between three different ski resorts: Vierli Skisenter, Rauland Skisenter and Raulandsfjell Alpinsenter. Rauland also boasts one of Norway’s best snowboard parks, Vierli Terrengpark. In the winter season the area offers a wide assortment of skiing opportunities with alpine skiing slopes, a spectacular snowboard park, mile upon mile of groomed cross-country trails and Norway's largest toboggan centre at Vierli. 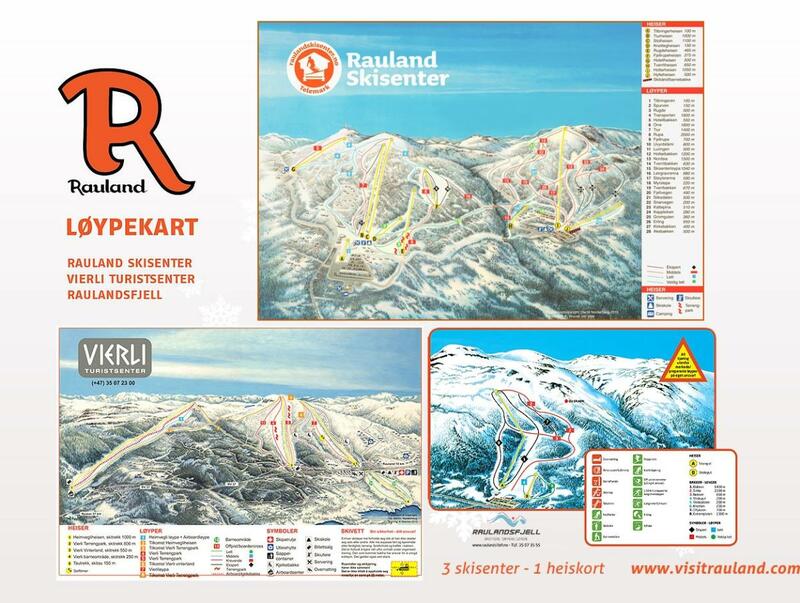 You can choose between three different ski resorts: Vierli Skisenter, Rauland Skisenter and Raulandsfjell Alpinsenter. Rauland also boasts one of Norway's best snowboard parks, Vierli Terrengpark. Rauland also offers winter activities such as dog sledding, snowmobile rides and snow rafting. Getting to Rauland and around is just as easy in the winter, as it is during summer. Rauland, home to around 1,500 inhabitants, is known for its many authors, artists and musicians, and a rich cultural heritage. The museums in Vinje, Raulandsakademiet, Telemark University College and Mjonøy Handicraft and Cultural Center are among the many cultural institutions that pass on the cultural heritage of which the region is so proud. Find more inspiration on Rauland’s official website. Cross country skiing in Rauland. Haukelfjell Ski Resort offers affordable, family fun in Telemarks magnificent mountain scenery. Heishuset offers afterski - ski in / ski out to Rauland Ski Resort. A collection of replicas of local traditional log buildings, filled with cultural activities. From Oslo, Stavanger and Kristiansand, take the train to Bø, then either of the express buses Haukeliekspressen or Telemarksekspressen to Åmot, where there is a local buss to Rauland. There are daily train departures from all the main cities. You can reach Rauland by bus from several destinations. Express buses combined with local services will bring you to Rauland from Oslo Airport Gardermoen, Torp Sandefjord Airport, Larvik, Haugesund, and Bergen. Want to go by car? Rauland has good road connections from Oslo, Sandefjord, and Larvik in the east, Kristiansand in the south, and Stavanger, Haugesund, and Bergen in the west. Rauland is situated about 220 kilometres from Oslo Airport and 190 kilometres from Torp Sandefjord Airport, which also has direct connections to many European cities. From both airports you can take an express bus to Rauland. The trip from the airport takes approximately 3 hours from Torp and 4 hours from Oslo Airport. From one of Norway’s most charming coastal towns to tall mountains and highlands, the county of Telemark is as diverse as it is beautiful. Go on a trip on the Telemark Canal and get a taste of what the county has to offer.